She’s a fabulous eye for quirk and this is the third of four posts from Katie. 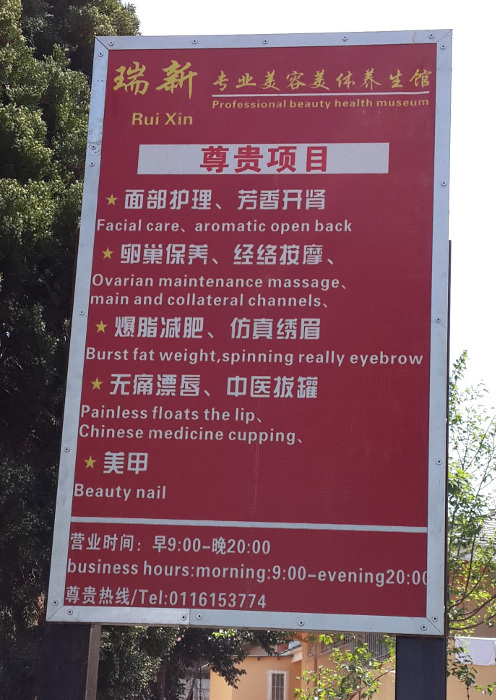 As I was shopping in the “China Town” area of Johannesburg, I stumbled on this massage and beauty parlour. Of course, the building was unwelcoming with a wall around it, which is usually the case in the country. I got closer to the sign to see if they had listed prices along with their treatments. Let me tell you, the treatment list was enough to decide that I honestly don’t want to battle with China Town parking for the sake of a massage. Never mind the prices. It’s not that all their treatments are out of the realm of understanding; I can grasp facial care. And although I’ve not undergone the cupping process, I understand it’s quite popular. I do believe that an ovarian maintenance massage is probably a good thing though I am not at all interested in that (mainly because I don’t want most people near my ovaries). But, I’m having a difficult time figuring out what “painless floats the lip” and “spinning really eyebrow” could be. I assume these fall under the “museum” part of this business. For awhile, I wanted to know what these processes involved. But, I’ve decided I don’t ever want to know. My imagination has done a lot of work, and I love the visuals. If you have no idea what spinning really eyebrow is, but you’ve got a delicious (or disgusting) image in your mind, please post it below.